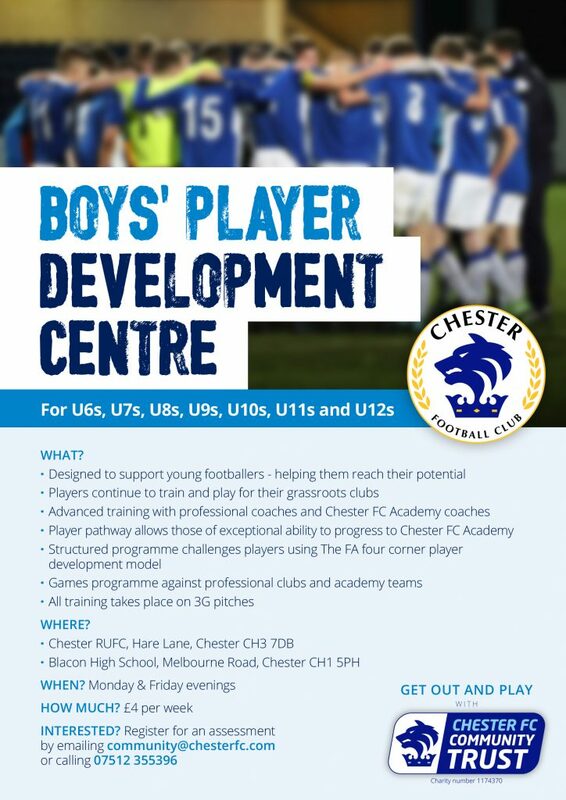 Applications are now open for this season’s Chester FC Player Development Centre programme for U6s to U12s. Designed to support young footballers in helping them reach their potential, the PDC provides advanced training with coaches from Chester FC Community Trust and Chester FC Academy. The structured programme challenges players using The FA’s four corner player development model and features games with professional clubs and academy teams. Players continue to train and play for the grassroots clubs with a talent pathway enabling those of exceptional ability to progress to Chester FC Academy. The programme runs for 12 weeks from September to December for U6s, U7s, U8s, U9s, U10s, U11s & U12s based on 2018/19 age groups. The 12-week programme costs £48 (£4 per week) with the option to add a Chester FC PDC training kit for an inclusive cost of £80. Please note the PDC is aimed at players who are performing to a high standard at grassroots level. Upton application, new players will be asked to attend an assessment session and if successful will be invited to join the programme. Prospective players can register for an assessment or find out further information via community@chesterfc.com or 07512 355396.